According to the Volunteer Protection Programs Participants’ Association, “getting the temperature right is important for employers as it provides the perfect environment for optimum employee productivity.” Workers who are coping with a stuffy, hot warehouse while they are picking, packing, storing, processing, or moving loads–all difficult, physical jobs–aren’t going to perform as well in the heat. A bigger issue may be retention. Employees making relatively the same money will leave for a better work environment. In today’s tight labor market, that’s become a real issue for many industrial facilities. A NASA study on temperatures, productivity, and accuracy confirms this. NASA found that higher temperatures have a profound negative effect on productivity and accuracy. At 75 degrees (F), work output drops 3%, and accuracy is unaffected. Output plummets 8% at 80 degrees, while accuracy is reduced by 5%. At 85 degrees, it gets worse: The productivity drop is 18%, while error rates increase by a whopping 40%. It gets much more difficult at 90 degrees, with a 29% output drop and a 300% error rate increase. In a hot warehouse in the middle of summer, many facilities will range into the 80-85 degree neighborhood if they aren’t air-conditioned. Like many industrial facilities these days, you are likely facing labor shortages and difficulties hiring people. Reducing turnover by increasing comfort is one of the most cost-effective ways to keep people satisfied and more likely to work for you. These are the work/rest ratios recommended by OSHA at various temperatures. For what the agency classifies as “heavy” or “very heavy” labor, the percentage of work recommended for physically fit individuals in proper gear, with proper hydration, is just 75% work and 25% rest per hour at 77 degrees. When it gets hotter, the amount of work per hour such a person should be safely expected to do drops to only 50% at 82 degrees. At 86 degrees, OSHA recommends just 25% work per hour. While these percentages sound restrictive, people working in the heat are absolutely not working full hours. Hazards that aren’t covered by other OSHA standards can fall under Section 5(a)(1). This section requires that employers provide a workplace free of recognized hazards that may cause injuries or death. Anything that isn’t specifically covered falls under this section. The hazard was recognized either by you, or in your industry–you knew it existed, or could reasonably be expected to know. The potential hazard has caused or is reasonably likely to cause death or harm. You had a reasonable way to prevent or materially reduce the hazard. This all seems to be common sense, and heat in an industrial facility checks all those boxes. There is ample documentation of heat-related hazards you could be expected to understand, and the fact that heat is a serious hazard is widely known. And of course, there are reasonable and economical ways to reduce warehouse heat as a hazard. They move huge volumes of air that HVAC alone can’t. In hot, sweaty conditions that cripple productivity and multiply errors, HVLS fans break up the moisture-saturated boundary layer surrounding the body, accelerating evaporation to produce a perceived cooling effect of up to 10°F. The effect on people is like a breeze on a summer day, even without absolute temperature reduction. With or without HVAC, large ceiling fans (called HVLS fans in the industry, for “high-volume, low-speed”), can be enormously helpful. HVLS fans don’t reduce temperatures–they make it feel cooler than it actually is by 6 to 12 degrees. For facilities that either cannot afford or cannot implement HVAC, it’s a highly economical way to increase worker comfort and retention in a tough labor market. 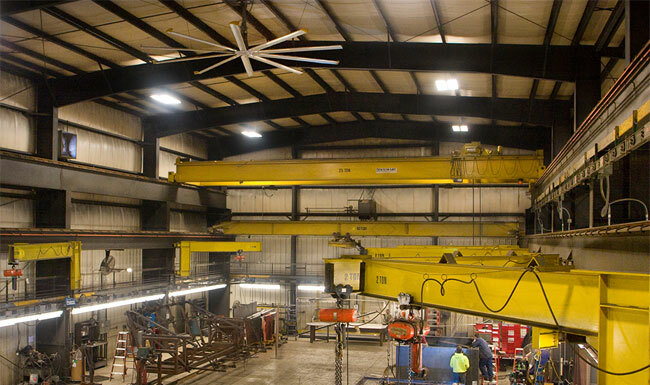 HVLS fans can efficiently circulate cooled air throughout the structure, making your HVAC more effective. With improved air movement, you can set your thermostat at a higher temperature without diminishing comfort–using 3 to 6 percent less energy per degree. This reduces cooling bills and increases employee retention while increasing productivity and reducing errors. For warehouses where doors must be kept open, strip doors and curtains help retain climate controlled air without impeding access for people or forklifts. High-speed and roll-up doors are also useful for containing climate. Directional fans are good for many applications and can help increase comfort for employees. Please contact us for more ways to increase employee comfort and reduce turnover while increasing productivity. What’s the Best Temperature for Your Building?